The Microsoft Arc Touch Mouse is one of my favorite and most used accessories for my Windows powered notebook. It is a very lightweight mouse, with an excellent battery life, that is perfectly suited for every modern nomad. The Microsoft Arc Touch Mouse is really thin, when not curved. This makes it very easy to store the Microsoft Arc Touch mouse in a small front pocket of Tom Bihn Empire Builder or the back pocket of the Waterfield Sleevecase. When you curve the Microsoft Arc Touch mouse, it is immediately switched on (you can see the blue BlueTrack light). The Microsoft Arc Touch Mouse offers enough support for my hand to comfortably rest on the curve of the mouse. Instead of a scroll wheel, there is a touch-sensitive strip between the two mouse buttons. If you would like to scroll up or down you simply swipe your finger up or down over the strip, while getting haptic feedback about the scrolling speed. Both the mouse buttons have a pleasant size and travel. Below the touch-sensitive strip there is a led, which flashes red in the case of low batteries. The Microsoft Mouse and Keyboard Center allows you to easily configure the mouse buttons and additional features in Windows 8. Download the Microsoft Mouse and Keyboard Center for Windows 8 here. 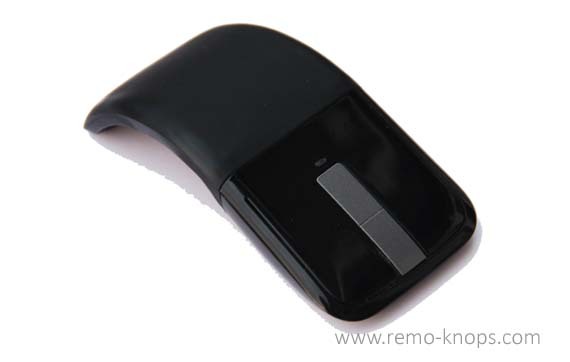 The Microsoft Arc Touch mouse comes with a small but unique to the mouse USB transceiver. 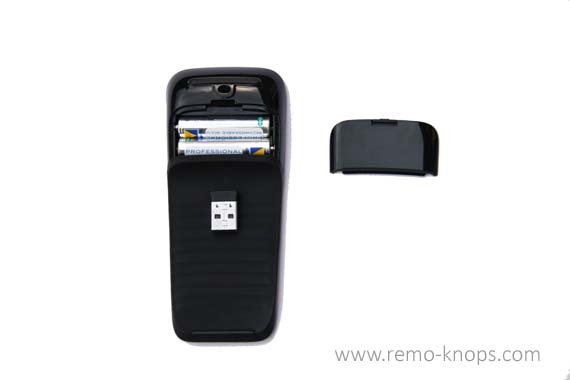 The backside of the Microsoft Arc Touch Mouse has a magnetic area in the case that you would like to remove the transceiver and attach it to your mouse. The Nano Transceiver however is permanently plugged into a USB port of my Lenovo work laptop. The Microsoft Arc Touch Mouse is a very compact and lightweight mouse, with a more than excellent battery life. I think I change the two AAA batteries once per half a year with intensive daily usage. Personally is this excellent battery life a major pro for buying the Microsoft Arc Touch Mouse. You can argue about the price point of €69.99, but honestly it is the best mouse I’ve ever bought and you get a lot of design- and technology for your money. The Microsoft Arc Touch Mouse is the perfect notebook accessory for every road warrior.